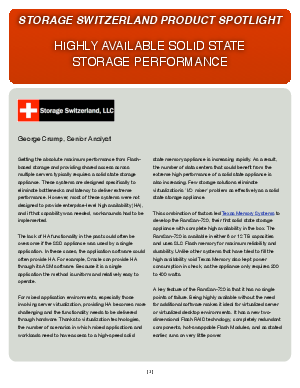 The lack of HA functionality in the past could often be overcome if the SSD appliance was used by a single application. In these cases, the application software could often provide HA - because it is a single application the method is uniform and relatively easy to operate. However, for mixed application environments, especially those involving server virtualization, providing HA becomes more challenging and the functionality needs to be delivered through hardware. Few storage solutions eliminate virtualization's 'I/O mixer' problem as effectively as a solid state storage appliance. This combination of factors led Texas Memory Systems to develop the RamSan-720, their first solid state storage appliance with complete high availability in the box. The RamSan-720 is available in either 6 or 12 TB capacities and uses SLC Flash memory for maximum reliability and durability. Unlike other systems that have tried to fill the high availability void Texas Memory also kept power consumption in check, as the appliance only requires 300 to 400 watts.